On the first page with the map of Gaul we see a Roman banner with S.P.Q.R. meaning Senatus PopulusQue Romanus (The senate and people of Rome). 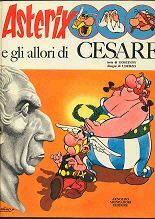 In the Italian books Obelix' motto is also SPQR. Publisher: Editrice Figure s.a.s Milano. Old Italian booklet in the Linus series. Contains full story plus Snoopy, Popeye and others. Translation differs from the main series. Current edition. Previously issued by Bonelli-Dargaud [albums: 1-24], and special promotional version by Il Giornalino [albums: 1,2,3,6,13]. New lettering, colors and covers as of late 2011. Since 2015 by Panini Comics. Thank you Robin Sommeling, David Eisma, Tim Kersten, Vincenzo Nati, and Kwee Tjoe Liong for additions and corrections. The dates were copied from the Cronologia di Stefano Samoggia e Rino Monreale, months added by Bruno Carpaneto. Publisher: Oscar Mondadori, Verona, Italy. The first nine Italian titles have printed around 1975/1980 as black & white small size books by Oscar Mondadori, like the English Knight b/w books. This edition has another map text, but the same translation.